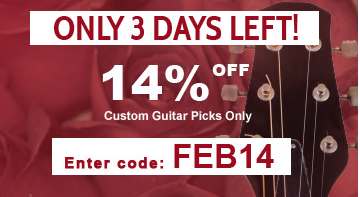 Last day to save 15% off your picks! BOO! Don’t forget to place your order today and receive 15% off custom guitar picks with promo code BOO16, you also will receive a free pack of Duraplex 0.60mm picks! We like to trick instead of treat! 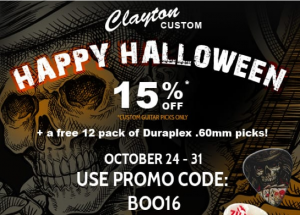 Now through Halloween get 15% off your Custom Guitar Picks PLUS a FREE 12 pack of our Duraplex 0.60mm picks! You don’t even have to say the old line “Trick or Treat…” just enter promo code BOO16 during checkout to get your discount. Last day to save 10% off picks! Don’t let this one blow on by! Hurry up and take advantage of our Fall Sale with 10% off your custom guitar pick order. Enter promo code FALL16 during checkout to get the discount! 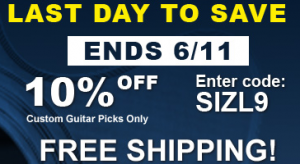 Category: Contests/Specials Clayton, clayton guitar picks, Custom Guitar Picks, Guitar, Guitar Accessories, guitar picks, Steve Clayton, steve clayton inc.
Don’t delay on placing your custom guitar pick order…there are just 5 days left for our 20% off Father’s Day Sale! Custom picks make wonderful Father’s Day gifts! 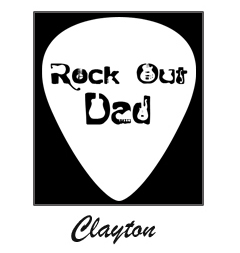 They are useful for Dads who like to rock out, and the custom printing on them adds that personal touch. 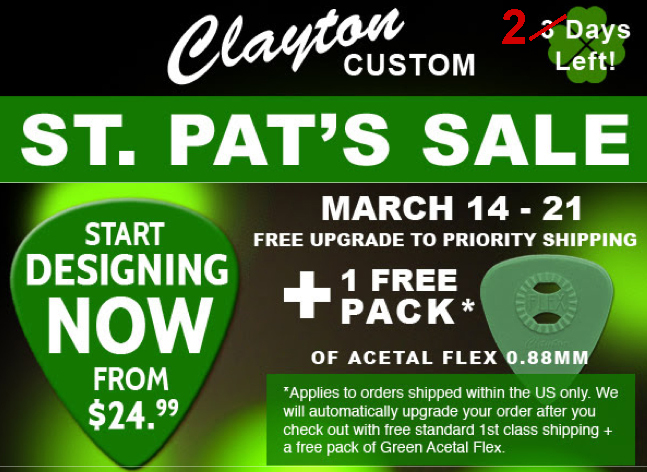 Now through the 14th, we are offering a 20% discount on all custom guitar pick orders placed through our website at www.claytoncustom.com. Just use the promotional code “DADSROCK” when you check out to have the discount applied! 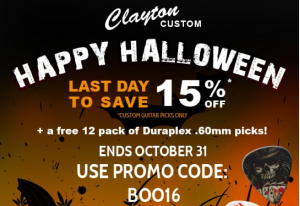 Don’t let our Halloween Custom Guitar Pick Sale pass you by! You can still order custom guitar picks any time today, or tomorrow before 11:59pm Central time, and get 10% off your entire order! 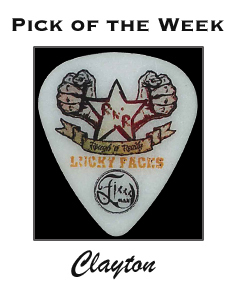 Just visit our site at www.claytoncustom.com to design and order your custom picks. Use the code BOO14 to automatically have the discount applied! If you are an early Holiday shopper, this is a great time to get a gift for that musician in your life! Two Days Left to Get Free Stuff! Hi Clayton Customers! Hope you had a great Labor Day Weekend! Just a reminder that there are only two days left to take advantage of our “Get Free Stuff” promotion! If you place an order for custom guitar picks by tomorrow, 9/4 at 11:59pm (Central), you will automatically receive not one, but TWO free packs of Clayton guitar picks! You will receive one 6-pick Variety Pack, and one 12-pick pack of Hex .73mm Yellow picks! 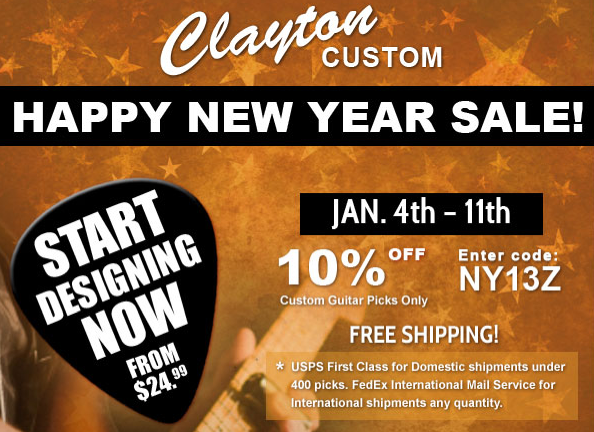 No promo code is required for this offer…you with get these free picks simply by placing your order as you normally would online at www.claytoncustom.com! 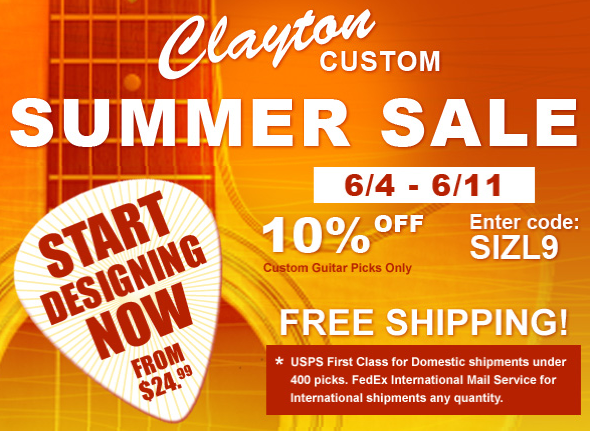 Our July Custom Guitar Pick Sale has begun! We are now offering 15% off all custom guitar pick orders, and this special lasts for only three days! Starting today, July 25th, you can place your custom guitar pick order online at www.claytoncustom.com. When the site prompts you for a promotional code, enter in CJUL14 to automatically have 15% taken off of your order total. Again, this is only for 3 DAYS! Ends July 27th at 11:29pm Central Standard Time, so get your order in ASAP! Get ready for our next contest!! Attention Clayton Fans! Starting today, we have a new contest running through our Facebook page! Check out the crazy photo in the image below. 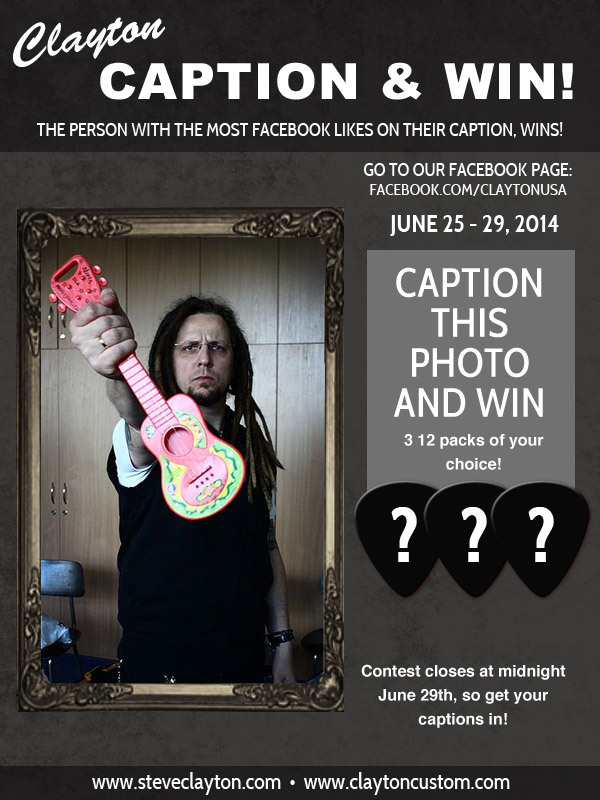 For the next four days, this photo will be posted on our FB page, and all you need to do is submit a comment with your best caption for the photo, for a chance to win your choice of 3 Clayton guitar pick 12-packs!! This contest ends at Midnight on June 29th, so don’t delay! 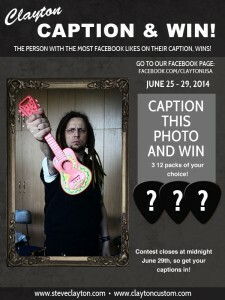 Visit www.facebook.com/ClaytonUSA to submit your most clever and witty captions! 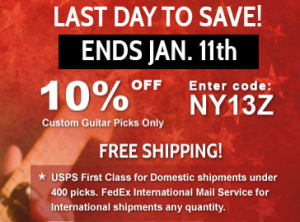 Don’t miss out on 10% off custom picks! Happy New Year! 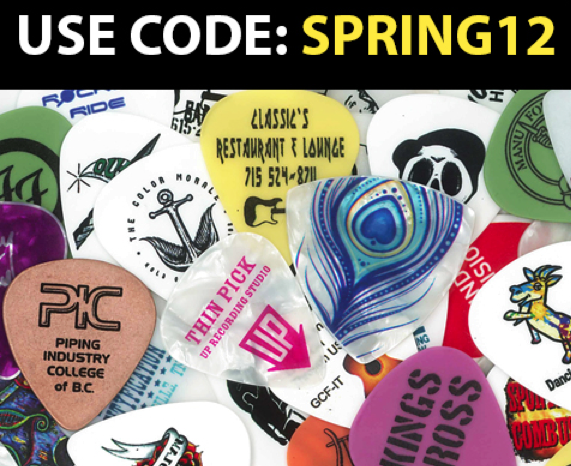 Did you see that we are currently offering 10% off on custom guitar picks?! This means that you can get custom picks for as low as $22.49 right now. Just enter promo code NY14V during check out to get the discount. This sale will end on January 10th so don’t wait too long ;-). Our Halloween sale is going on right now! There are only 6 days left to take advantage of 10% off your custom guitar pick order! Also, have you seen our newest materials we custom imprint on? We now custom imprint on Stainless Steel, Copper and Brass picks. To get 10% off your order simply add in the promo code included in the image below during check out. If you are not receiving our newsletters and would like to you can sign up on our this page, you will receive emails about our current promotions. Hurry up! 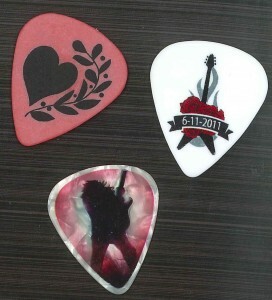 Only two days left to place your order for custom guitar picks and still receive a 15% discount! 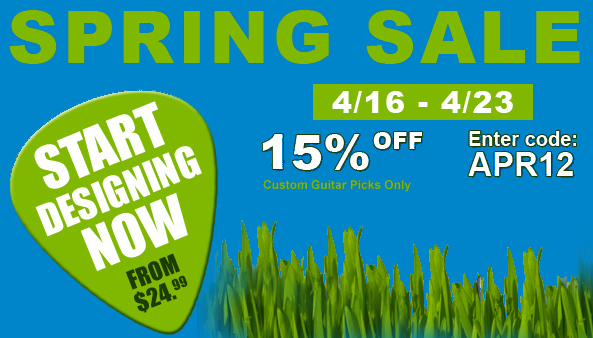 We are currently running our Spring Sale and you can take advantage of getting 15% off any order of custom guitar picks. Just visit www.claytoncustom.com to create your design and place your order. When the site prompts you for a promo code, enter in the code SPR13 and the discount will automatically be deducted from your order! This sale ends at 11:59 central standard time tomorrow, 4/23, so get moving before this great deal blows away! Order custom guitar picks today! 3/19 is the last day of our St. Patty’s Promotion. 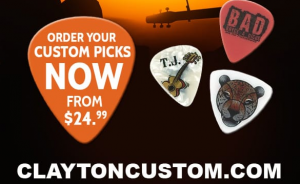 If you place your order for custom guitar picks on our site at www.claytoncustom.com, and choose the USPS 1st class shipping option for orders shipping within the US, we will automatically upgrade your order to a free Priority shipment! You do not even need to enter in a promotional code to take advantage of this offer…we will take care of the upgrade for you once the order is placed. And that’s not all! 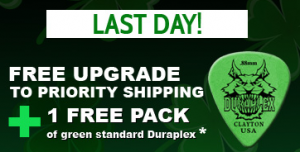 In honor of the favorite color of the Irish, we will include a free pack of our popular Duraplex guitar picks, in green .88mm! So don’t hesitate, get that order placed ASAP!! For those of you who might have missed it, our Valentine’s Day Sale is currently running! We are offering 14% off any custom guitar pick orders placed by this Thursday, the 21st. 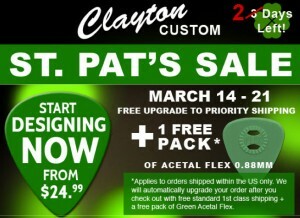 To order your custom picks, visit www.claytoncustom.com. Create your pick design and save the design in an online account with us. Then click on the “Order Pick” button once the design in finalized. When completing the order process, the site will prompt you for a promotional code. Use FEB14 (all capital letters, no spaces) to have the 14% discount automatically applied. We are also offering free standard shipping for orders of less than 400 picks shipping within the US! Don’t delay; get your order in before this sale is out! 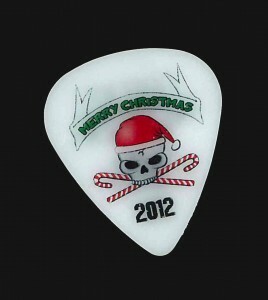 There is only one day left to order custom guitar picks and receive your 10% off New Year’s discount! 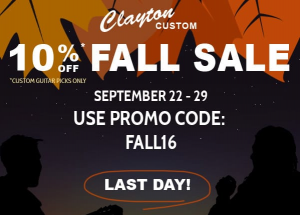 To take advantage of this sale, start by visiting www.claytoncustom.com to design and order your picks, or place a re-order of a design that you have already saved. Once you start the order process, you will be prompted to enter in a promotional code. Use the code NY13Z to automatically have 10% deducted from your total! Again, this sale only goes through midnight, central time, today. Order now! Our New Year’s Sale Is On! Going on now: Our Happy 2013 New Year Sale! Order any time between now and January 11th to receive a 10% discount on your order of custom printed guitar picks from Clayton, USA! 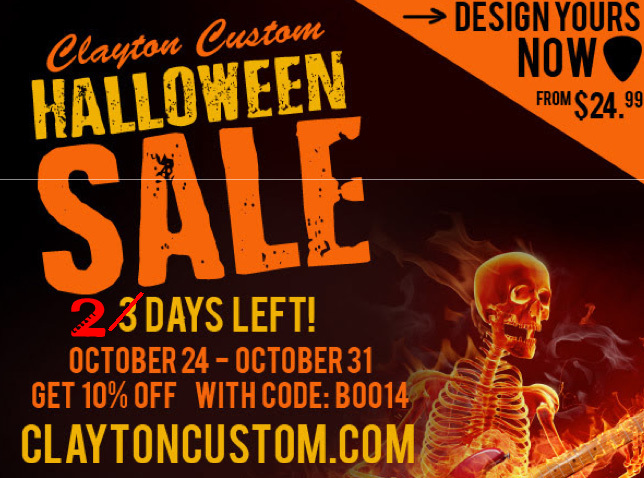 To take advantage of this sale, start by visiting www.claytoncustom.com to design and order your picks, or place a re-order of a design that you have already saved. Once you start the ordering process, you will be prompted to enter in a promotional code. Use the code NY13Z to automatically have 10% deducted from your total! Again, this sale only goes through midnight, central time, this Friday the 11th. So don’t delay! We are going to share a little secret with our devoted blog-readers; today is a great day to start working on a custom guitar pick design, because our Christmas Sale starts tomorrow! Make sure to sign up for our newsletters with your email on our contact page. You will automatically have an e-mail blast sent to you tomorrow with a discount code for 15% off your entire order! 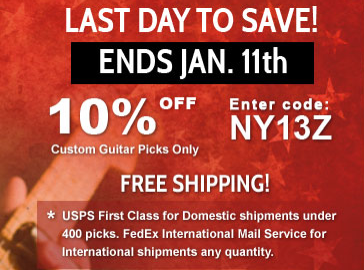 It’s not too late to order custom picks for holiday gifts, so be sure to take advantage of this sale that will only last three days! It’s Cyber Monday everyone, and our super sale is on! For one day only, we will be offering 20% off custom guitar pick orders! 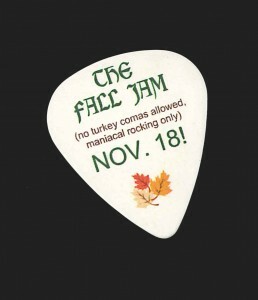 To order your custom picks, visit www.claytoncustom.com. When prompted for a promo code, enter in: and you will automatically receive 20% off your order. We offer 14 different pick materials to choose from, in a variety of shapes and gauges. 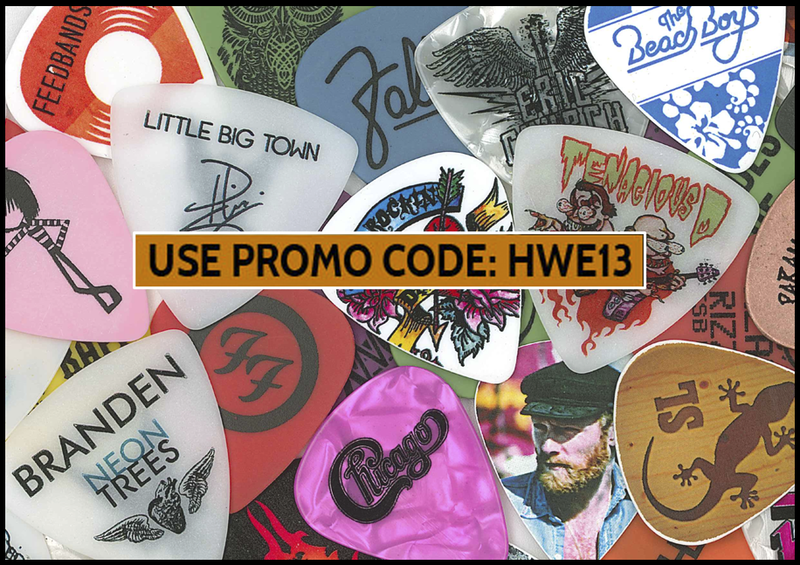 Pricing starts at just $24.99 and we offer free 1st class shipping on all orders of 300 picks or less! Again, ONE DAY ONLY on this sale!! Will end at midnight central time! Start your design right away!!! Don’t Let Our Thanksgiving Sale Pass You By! This sale is three days only, so be sure to take advantage of it! Order custom picks now, and automatically get 15% off your order by using the promo code: TK12G. The sale started yesterday, so you can still order anytime today or tomorrow to use the 15% code. To order, visit www.claytoncustom.com and choose and design your picks. Save your design and click on the red “Order Pick” button to place your order. During the order process, you will be prompted for a promo code, so enter in promo code TK12G and the discount will automatically be deducted. Now is the perfect time to get a jump start on that holiday shopping! Shown here is one of our customers’ custom fall designs, done on our Eco picks in natural…one of our new custom pick items! Last Day for 10% Off!! Clayton customers! Today is the last day to order custom guitar picks and still get a 10% discount on your order! 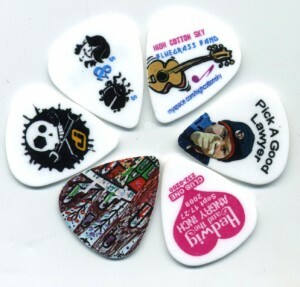 Just visit www.claytoncustom.com to design and order your custom picks. When the site prompts you to enter in a Promo code, use SIZL9 to automatically have your discount applied! You can order any time before 11:59 PM central time this evening (6/11) to take advantage of this offer. Also, custom guitar picks make the perfect Father’s Day gift, and it’s not too late to order them to have in time for the 17th! Don’t delay though, because time is running out! Don’t Miss Out On Our Spring Sale!! Attention Clayton Customers!! Only five days left for our Spring Sale! 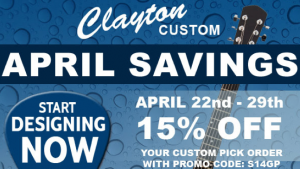 Right now, we are offering a 15% discount on any order of custom guitar picks placed on our website at www.claytoncustom.com!! This sale goes through this coming Monday, the 23rd of April. To use your discount, visit claytoncustom.com to create your custom pick design. Then, you can order your picks directly from the site! During the online order process, you will be prompted to enter a promotional code. To receive the 15% discount, use the code APR12. Be sure to use all capital letters and no spaces when entering in the code. Remember, this code will expire at 11:59pm central time on the 23rd, so don’t delay! Also, be sure to check out our custom drumsticks that we now offer, at http://www.claytoncustom.com/drumsticks/! !